When you tell someone that you’re a fan of horror, they will immediately assume that you’re specifically a fan of horror movies. While it is true the silver screen has been its primary source, ever since Bela Lagosi’s DRACULA uttered his maniacal “Good evening,” this should not suggest that it is the only medium for which us fans may indulge. In fact, ever since Ancient Greece, plays depicting the supernatural and horror have been a prominent feature of our human existence. We Westerners can trace our heritage of the genre as far back as Shakespeare. 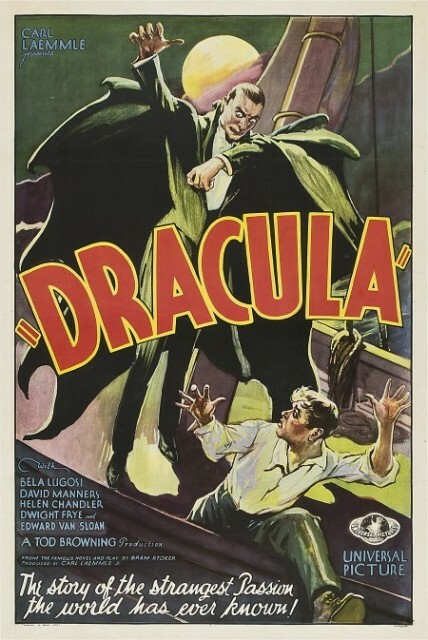 Not only does Horror have a long and distinguished history of being performed “Live,” many of us would be surprised to learn that Lagosi had been portraying “Dracula” on Broadway years before his native Hungarian accent would become forever linked to the character in thanks to Universal Pictures. For the last several months, a childhood friend of mine, Brian Burke, had been encouraging me to check out the work of a Chicago based theater company called “Wildclaw Theatre” for which he was affiliated. When my family had been experiencing difficulties regarding divorce and a fractured income – the Burkes had adopted my brother and I as their own and included us in many of their outings and activities. Their unsurpassed generosity was not only doled out without hesitation, it was done in such a way as to never make us feel like charity cases. My gratitude for his family meant there was NO way I could not oblige Brian, though I had little interest in seeing a horror themed play. After all…How could something being performed right in front of me be as effective as the technology offered by that of a motion picture? Regardless, I committed myself to seeing their latest offering, KILL ME, at the Athenaeum Theatre in Chicago. Not wanting to watch the play alone, I asked my old friend, Suzanne, to accompany me. We hadn’t seen each other in years and this seemed a nice opportunity to reconnect. I was surprised she agreed to go since Suzanne is not a horror fan and, if my memory served correctly, she was also notoriously hard to please when it came to the myriad of movies and plays we’d seen together back in the 1990’s. She’d be looking for good “theater” while I’d be looking for decent “horror” and I figured, at best, maybe one of us would walk away satisfied. To be honest, I actually had no idea what to expect. I am no stranger to plays nor of horror but had never seen the two mixed together. I made up my mind that this was either going to be “two great tastes that go great together” or the proverbial union of oil and water! After getting our tickets (which playwright, Scott Barsotti, was kind enough to have waiting for us at the box office) we took our seats in the quaint auditorium where there was no such thing as a bad vantage point. As I enjoy “people watching,” I decided to take my favored spot – way up in the back. Brian, saw me from a few rows ahead and waved before the show began. “Oh, great,” I thought. “How am I gonna pretend to like this so I don’t hurt his feelings afterwards?” Fortunately, the only acting required for this evening would be conducted on stage. The play deals with three main characters; Cam (Sasha Gioppo), Wendy (Casey Cunningham), and Grace (Michaela Petro). Grace reluctantly joins her girlfriend, Cam, as she seeks the aid of her estranged sister, Wendy. Aside from the familial connection, Wendy is a psychologist and her skills in this profession are what they are primarily in need of. Prior to this awkward family reunion, Cam and Grace had been involved in a car accident – leaving Cam in a coma for exactly one week. When she awakens (a miracle in itself due to the nature of her injuries) she discovers that she has been decisively changed. 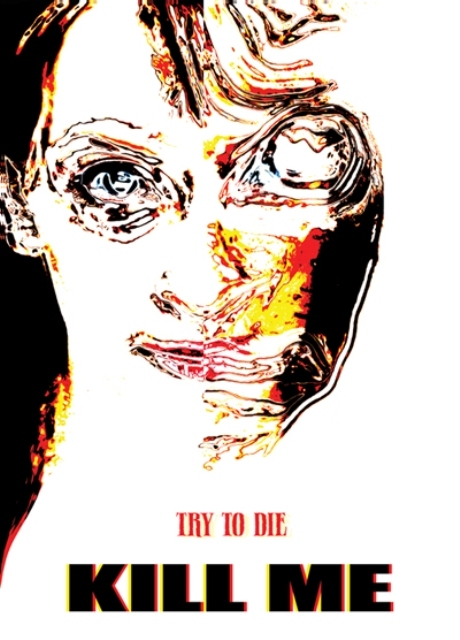 Cam has come to discover that she is virtually death proof and initiates gruesome ways of proving her new-found invincibility to her horrified sister and distraught girlfriend. Needless to say, Wendy is not about to cast aside years of schooling in favor of embracing these supernatural claims – especially from a sister who has historically given her the creeps. Grace isn’t quick to buy into it either, though it appears to be more out fear than of pragmatism. Beyond the scope of either hers or Wendy’s vision, are the presence of four demons – closely keeping vigil and tormenting Cam. They were genuinely creepy and their imagery, combined with their slow & methodical movements, was so effective it reminded me of last year’s horror movie hit, INSIDIOUS. When the play ended (70 minutes with no intermission), I turned to Suzanne and she enthusiastically said, “That was GOOD!” I wasn’t surprised. The acting in this play was superb and I could see all of these players having a bright future. Their performances were so perfectly synchronized, the audience literally becomes lost in it; the veil between stage and viewer slowly dissipating. I had assumed this was only possible in a film (where lights and production features are hidden from a camera’s view) and was ill prepared at how wrong I would be. In fact, in many ways, the “Live” aspect made it even more effective. The dialogue was gripping – providing deep, psychological insights that most all of us feel but few can articulate. Many of us admit a fear of death, but how many of us can truly grasp what immortality would actually mean? These are the kind of questions the audience is forced to confront when watching KILL ME. Afterwards, we were able to meet the cast and crew – truly AMAZING people who treated us like celebrities. I was invited to return again and intend to do just that within the next couple of weeks. I urge anyone in the Chicagoland area to go to the Wildclaw Theatre site HERE and get their tickets ASAP. 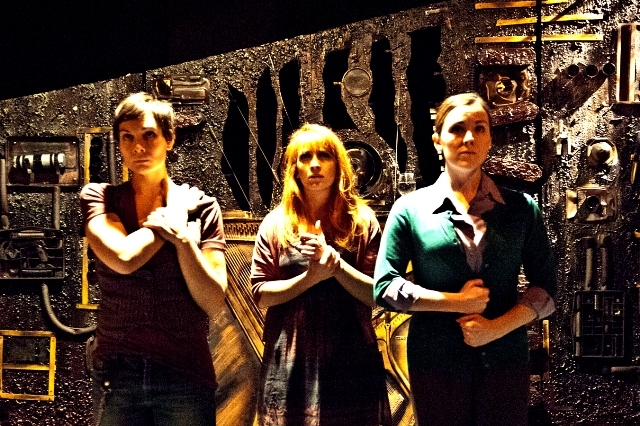 These tickets are affordable and the experience of a Live horror show proved priceless! Like any intense horror film, this play is not intended for children but adults are encouraged to show up “casual,” with a bar nearby (you can even bring your drinks into the theater). I guarantee, whether you are a fan of horror or of good theater, you will NOT leave disappointed! 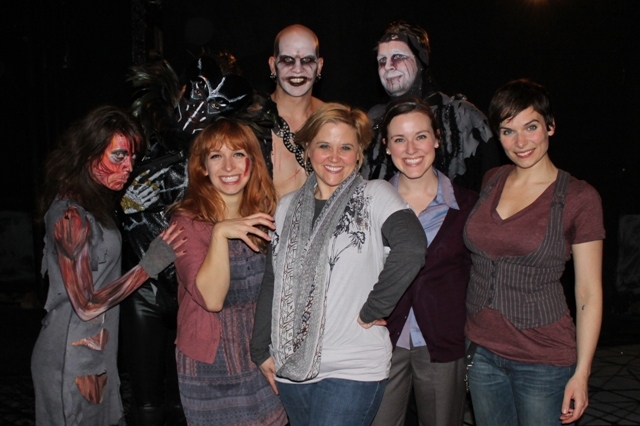 Suzanne with the cast of KILL ME! Fans of horror movies will also want to catch our interview with KILL ME‘s talented writer, Scott Barsotti, which will be posted this weekend. If my take on this play hasn’t convinced you that we have our place in the world of theater, then I can assure you that getting to know this fellow horror fan, surely will! This entry was posted in Horror Theatre and tagged Athenaeum Theatre, Casey Cunningham, Dracula, Jude Roche, KILL ME, Michaela Petro, Sasha Gioppo, Scott Barsotti, WILDCLAW THEATRE. Bookmark the permalink. ← A Day at the Races…with Horror Host Svengoolie! Omg…I sound like the kathie lee to your Regis….but anytime you need a companion…I’m your slightly (well maybe more than slightly) inappropriate date! !